Sam Concepcion talks about his longtime friendship with Gary V.’s daughter Kiana. 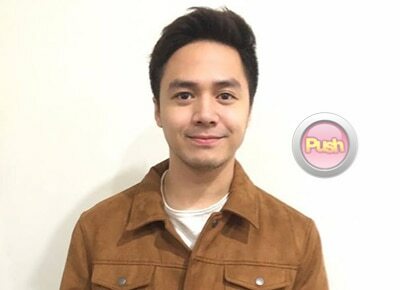 Apart from promoting his latest album this year, Sam Concepcion said he is also gearing up to shoot a new next music video in Japan this month. "I’m going to be shooting a video in a few weeks sa Japan and maybe a new TV show coming soon too. Japan is a nice place. It’s beautiful out there and I don’t know if I can give the details yet but I’m very happy to be doing this project with Japan. It’s a partnership of some sort. We’re still talking about it,” he shared during the PAWS Philippines Pet Blessing 2016 held ay the SM Skydome in North Edsa last October 1. The 23-year-old performer admitted he enjoys performing for fellow animal lovers which is why he did not hesitate to show his support for the annual PAWS Philippines event. "I support the cause of course. I love dogs. Right now I have two dogs, they are three and one years old na Yorkshire Terrier and Shih Tzu at home. Their names are Wicket (named after an Ewok) and Mr. Reeves,” he told Push.com.ph. After recently being linked to Gary Valenciano’s daughter Kiana, Sam said their friendship goes a long way back and has even talked to her about getting into showbiz. "I’ve always said this even before pa I would always tell her sayang kasi she was in school and taking up a fashion thing. I told her she should sing. And I know that’s what she’s doing now. She’s writing songs. I’m not sure if I have any advice to give her because she grew up in front of the spotlight. I just feel like she probably knows more about it more than I do,” he explained. Although he admitted they spend time together, Sam remained elusive about their official status. "Sure, yeah (we go out). Of course. We share friends and we share the same interests like music. A lot of music. I don’t even know what to say. But here’s what I can say, if there’s something that I can really, truly say about it, then I will. But till then, do you know what I mean? Until I have something to really disclose. I don’t know how to say it. I’ve known her for a really long time. A really, really long time as kids. We’re definitely close friends. I can’t deny nor confirm anything at all (laughs),” he explained. Sam also shared what makes the two of them click. "She’s one of those weird kids that you meet as kids. I guess I am one of those weird people as well. You kind of meet weird people along the way that you can be weird with (laughs),” he added.